If you would like to visit the Archive, which is located in the State Office in Macon, let us know. We will be happy to arrange a visit. 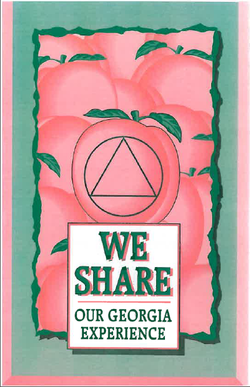 CLICK TO READ THE ORIGINAL WE SHARE OUR GEORGIA EXPERIENCE IN PDF FORM! What is the Archives Committee? Like any other A.A. service, the primary purpose of those involved in archival work is to carry the message of Alcoholics Anonymous. Archives service work is more than mere custodial activity; it is the means by which we collect, preserve and share the rich and meaningful heritage of our Fellowship. It is by the collection and sharing of these important historical elements that our collective gratitude for Alcoholics Anonymous is deepened.